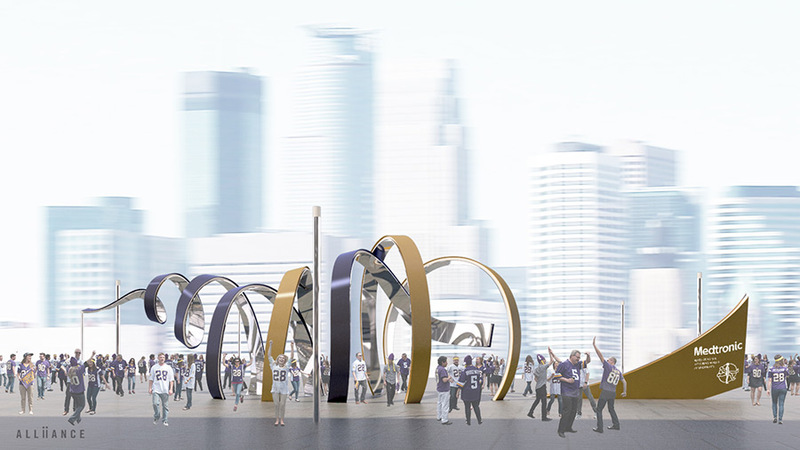 Minneapolis, MN – May 11, 2016 – Medtronic and the Minnesota Vikings announced Medtronic’s contribution of a new contemporary art sculpture on Medtronic Plaza, outside the Vikings’ new home at U.S. Bank Stadium. 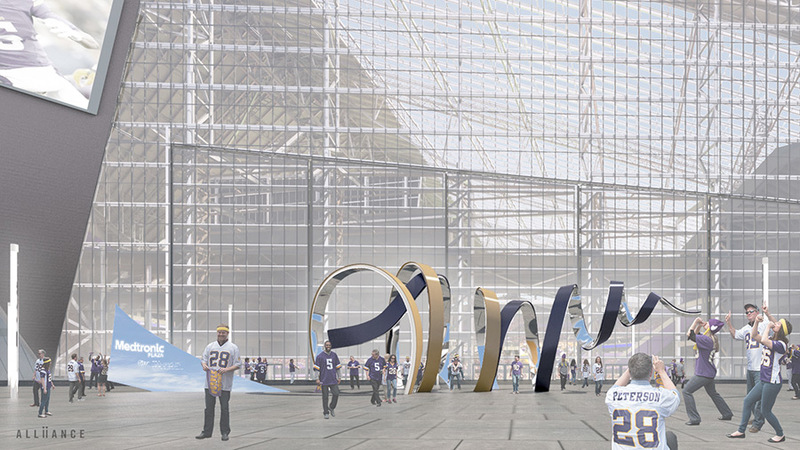 Funded privately by Medtronic and designed by Minneapolis design firm Alliiance, the monument is titled “The Horn.” The Horn sits as a landmark on Medtronic Plaza at the west entrance of U.S. Bank Stadium. The Horn inspires the spirit with a pair of spiraling ribbons that entwine, reflecting Medtronic’s message of “Further, Together.” The inner surfaces of both ribbons are polished and seamless mirrors, reflecting the many faces of the community who come to explore and interact with the sculpture. 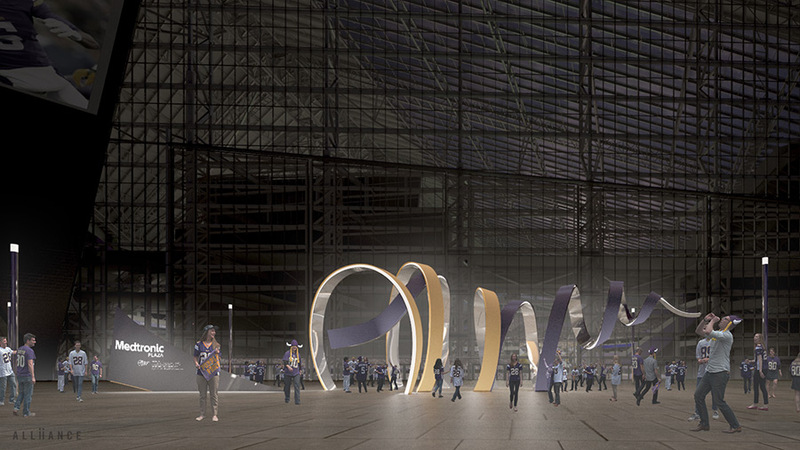 The combined shape of the spirals represents the Gjallarhorn, a familiar symbol to Vikings fans which is sounded prior to all home games. Once erected, the sculpture will be approximately 107 feet long, 30 feet wide, and 25 feet high, weighing over 38 tons. 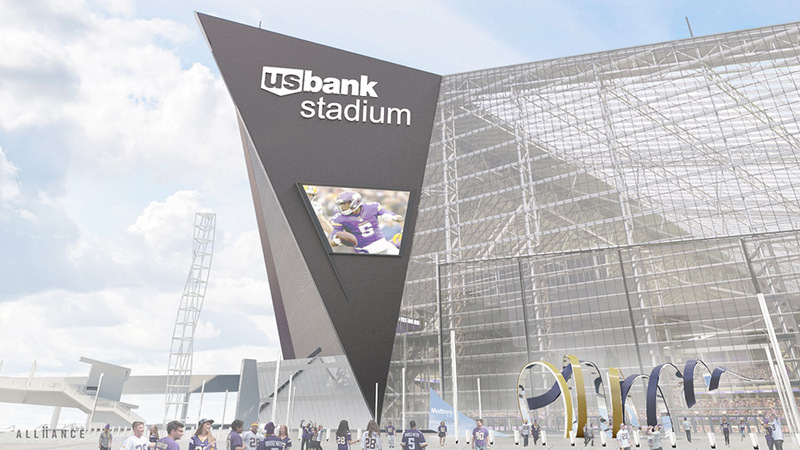 It will be constructed using structural tube steel and plate steel framing, mirror finish stainless steel, and painted metal panels. Embedded LED lighting will ensure the sculpture is animated at night. “Alliiance has worked with Medtronic for over 35 years, and we feel extremely honored to be able to design a monument that embodies their commitment to this community,” said Ross Naylor, Principal of Alliiance. Installation is expected to be completed in August 2016.